Alan Wake uses one thing that is sparingly used as a major plot device in the world of horror. You have your monsters, your ghosts, and everything else in between, but there’s one very effective form of terror: darkness. You don’t know what’s in the dark, which is why it is so intimidating. And when you’re in a world of darkness, you have but one thing to save you from it: light. Few video games have really explored this concept, and so when I played Alan Wake, I was surprisingly intrigued by it. And how cool is that cover? Simple, yet effective. In this game you play as Alan Wake, a novelist who is trying to write another book, and you go on a vacation to a little town by the forest called Bright Falls with your wife Alice. Alan just wants to relax with his wife in the cabin they have, but when Alice tells him that she brought a typewriter so he could try working. Alan, angered that she tried to help him write, lashes out at her angrily and storms out of their cabin. The lights flicker off inside the cabin and Alan’s wife, who has a phobia of the dark, is shouting for him. Alan tries to run back to the cabin but when he gets there, his wife appears to have ran off the balcony and into the lake their cabin is on. Alan dives in the water to rescue her, and the next thing he knows, he wakes up in his car after it crashes. After this, Alan goes through the woods at night and tries to make his way to a nearby gas station. All he has is a flashlight to light his way. 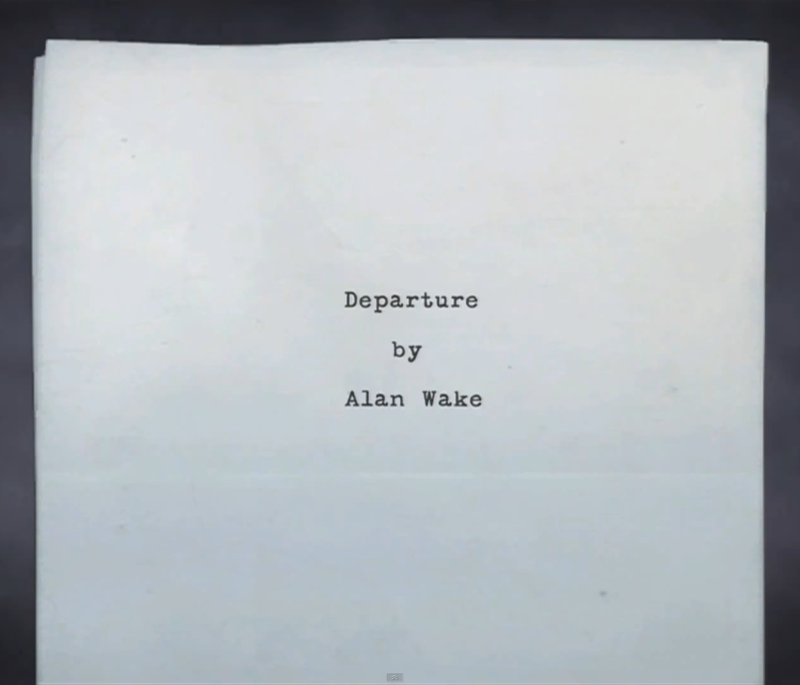 He soon comes across a manuscript page that reads “Departure,” the title of a book that Alan wanted to write. As he collects more pages, it tells the story of a man who is being attacked by an axe murderer. Shortly after that, Alan himself is attacked by an axe murderer with a warped voice. The story progresses as you collect these pages, and you soon realize that everything written has come true in this world, no matter how outrageous or insane it sounds. When Alan makes it to the gas station, the sheriff arrives and asks him what he’s doing. Alan informs her that his wife is missing and that he needs to find her. He explains that they were staying on the cabin in Cauldron Lake, but the sheriff informs Alan that it is impossible since a volcano erupted in the 1970’s and took the cabin out. Alan doesn’t believe it, but when the Sheriff takes him there, the cabin is gone. Alan must then hunt down his wife Alice, and he seems like he’s willing to do anything to do it. Unfortunately, he will also have to brave the evils swirling in the darkness. Dual wield pistol and flashlight action. Eat your heart out, Halo. Now that’s just the beginning of Alan Wake, and I’m not going to go more into the plot details of this because the game is best enjoyed when you have no idea what is going on. However, I’ll touch upon the basic gameplay premise. I know, I usually only talk about story stuff, but I promise the gameplay is very important to the story. As you go through the darkness, you have to fight off a bunch of specters who wield various sharp weapons. These things are brought to life by something called the “Darkness.” The only way that you can defeat them is by shining your flashlight at them and increasing the beam’s power to take down their defenses. Then you shoot them away. So essentially you’re fighting the darkness with light which is a very basic concept, but the way in which it is used is so unique. You can only get a checkpoint or get to safety by reaching a major source of light, like a lamp post. So this means that you can either try to kill everything in your path… or you can just make a run for it. I love this concept, as it means more options for survival. 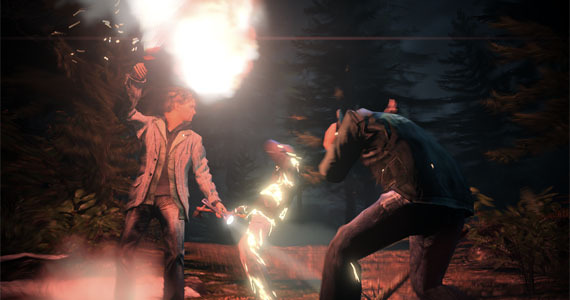 Also, some of your other weapons in Alan Wake are charmingly helpful against the enemies. A flare can be used to ward off all of the dark creatures, simply by raising it up and walking towards them. They’ll cower away from it, allowing you advance forward without fear of being attacked. You can also walk them off a cliff or into other hazards too. You can also use a flare gun to instantly kill anything nearby. It is like the rocket launcher of the game, and it shines a bright light that wards off any enemies from the area. Like a real flare gun, it is used only during emergencies. A flashbang can also be thrown to achieve the same result. You can also use natural light to weaken and hurt the enemies to help you out. For instance, if you can knock a ghost into a car’s light’s it will instantly lose its shield, making it easy to blow it away. Somehow, the game makes enemies that are weak to a flare seem intimidating still. In the darkness, you feel like you absolutely need to find the light. It isn’t just an option like in many horror games, it’s necessary. You follow the light to survive. This is so simple, yet so effective. And the game is always obsessed with that concept of light and dark to the point that you just understand you need to get yourself to any source of light immediately. That makes the atmosphere tense throughout the entirety of Alan Wake, simply because you have to trek through the dark where you know there could be anything lurking around to surprise you. You can just be walking and you are suddenly surrounded by ghostly killers. The environments you need to get through are outstandingly chilling as well. There’s something about a forest that becomes even more terrifying when you know it is dark and you can’t see much ahead of you. Or when you’re walking through a town and suddenly all of the lights shut off, letting you know that the darkness is about to swallow you. The game keeps you on edge at all times, ensuring the perfect atmosphere. And while the world around you falls apart, you keep picking up these pages from a manuscript that Alan was seemingly working on but had no idea he wrote. What is chilling about this is that it talks about what is going to happen. So when you pick up something, there’s a vague sense of dread when you realize something bad is about to happen. However, when something good happens (and yeah, rarely good things will happen), Alan Wake provides these pages after, just so you know you aren’t anywhere near clear. These pages also provides additional commentary on what is going on around you. It tells the story of your terror as it is happening. This is such a brilliant storytelling mechanic since it gives you all of the background and additional information in a subtle-yet-clever way. Somehow I don’t think Departure will make the best seller list. The story is by far the best part of Alan Wake though, and that story is the main reason I went through the game so fast. The gameplay gets a bit tired as you play it, but the story keeps you intrigued for the duration of the game. When you go through each chapter, the events that happen around you are terrifying. Enemies pop out around every corner. Something new and crazy continues to happen. When you think you find solace in the light, the light suddenly goes out. It is incredibly easy to get overwhelmed. You have no idea what is going to happen next, but it promises to surprise you each time. And that curiosity is what keeps you trying to get through the game. Most importantly, this game always keeps you guessing when it comes to major plot points. Yeah, your wife Alice is gone and you’re trying to find her, but you won’t expect any of the plot twists that come with. Every single plot-related point was shocking to me. Not only that, when you think nothing makes sense and that you won’t get any real answer—don’t worry. You’re getting an answer. I mean it; this game is surprisingly cohesive given what happens throughout the story. You’re going to be very satisfied with everything the story throws at you, and that is what will keep you playing the game. Alan Wake isn’t all dark and depressing though. 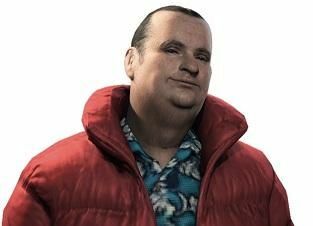 They add in Alan’s agent, Barry Wheeler. He provides the comic relief for the story and is a constant beacon of amusement even when things are bleak. Throughout the story, you are also treated to seeing how close Alan and Barry are. They often make fun of each other, and despite being a coward Barry is always there to try and save Alan and help him find his wife. The comic relief and banter he provides with Alan is much needed when the game seems like it is going to be bogged down with seriousness. The times where they have Barry being Barry are never really used at the wrong moments either. You see this guy? This guy is your bro. And you just need to deal with that. 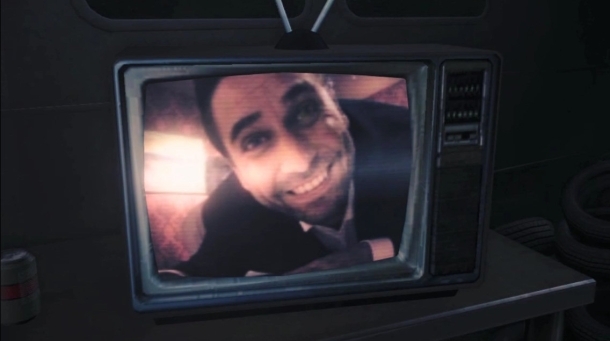 But let’s talk about the character of Alan Wake too. Alan isn’t a perfect guy. You find out that he’s got his problems. He’s a hot head, he neglects his wife a bit, and he sometimes goes overboard. The game uses this throughout the story to really drive home what is going on with Alan and how it is affecting him mentally. The antagonists that Alan faces are constantly poking and prodding at him where he is most sensitive, and that really helps you connect with him. The story is as much about Alan finding his wife as much as it is finding out what is up with Alan. The little tidbits of fun extras you get in the game are great too. You can turn on a radio you find to get the local radio guy talking about what is going on around town at night. Sometimes he’ll have people on and get their insight. It isn’t necessary, but it’s a really nice addition. You can also read the history of the town from reading signs, and you quickly find out that the town is pretty messed up. Perhaps the best bonuses are that any TV you find can be turned on to watch a short few minute episode of a show called Night Springs, a knock off of The Twilight Zone. They don’t add anything to the story, but man are they entertaining and cheesy. And when you finish the game, it also includes two DLC chapters you can play. They are a direct continuation of the original game and involve the consequences of what happens at the end of Alan Wake’s main story. 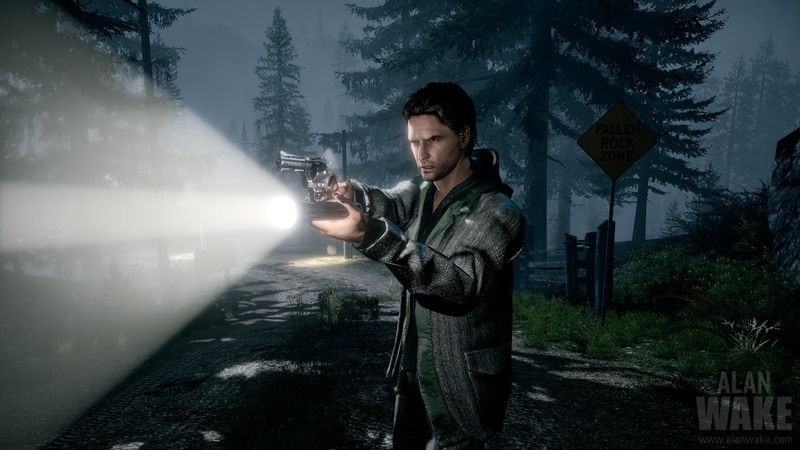 It is a very strange trip that takes a very in-depth look at the character of Alan Wake. And my god, does it get absolutely chilling at some points. This is where Alan Wake’s voice actor really blows everyone away. I think they are absolutely worth it to play, if only to see the creative stuff that they pull off with the story and mechanics. If you’re a fan of good horror stories, check out Alan Wake. It might not be the most terrifying game you’ve ever played, but it might be one of the best psychological thrillers you’ve ever experienced. It is a fun ride throughout the entire game and very simply one of the cleverest stories you’ve experienced in a game. It’s so good that it almost feels like a movie in that regard, and that is a high compliment for the presentation of any game. 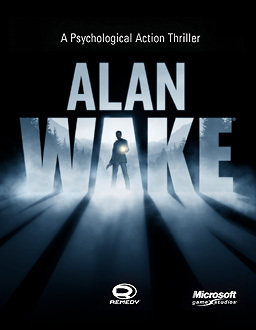 Go play Alan Wake on Xbox 360 or PC through Steam. You won’t regret it. These will always creep you out, no matter what.